The rise of the regulatory state has been a major feature of modern constitutional democracies. India, the world's largest democracy, is no exception to this trend. This book is the first major study of regulation in India. 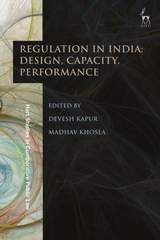 It considers how the development of regulation in India has altered the nature and functions of the state; how it is reshaping the relationship between business and the state; how it has called for the refashioning of established legal principles; and how it has raised new questions about the relationship between technical expertise and the rule of law. The chapters cover topics ranging from the foundations of the Indian regulatory state to the form of regulation across different sectors to regulation in practice. Together, the chapters reveal the challenges, promise, and limitations offered by contemporary regulatory practices, and they capture the close if sometimes fraught relationship that regulation must inevitably share with the political economy and constitutional schema within which it operates. 13. The Enforcement of Indian Competition Law: Administrative or Regulatory? Devesh Kapur is the Starr Foundation South Asia Studies Professor and Asia Programs Director at the Paul H Nitze School of Advanced International Studies (SAIS) at Johns Hopkins University, Washington, DC. Madhav Khosla is a Junior Fellow at the Harvard Society of Fellows.